FEC Greenlights More Convention Cash For Political Parties : It's All Politics The Federal Election Commission approved a request from the Democratic and Republican parties to replace lost public funding with more donations from individuals — up to $32,400 per person per year. President Obama, is watched by Mark Miller, back second from left, Ellyn Miller, and their son Jake Miller, left, as he signs the Gabriella Miller Kids First Research Act, into law in the Oval Office this spring. The Democratic and Republican parties complained to the Federal Election Commission that the law took away public funding for their political conventions. Anyone concerned about how the two parties would pay for their national conventions after a new law took away their public funding can stop worrying. The Federal Election Commission approved a joint request Thursday by the Democratic and Republican parties to let them accept as much as $32,400 per donor per year – for conventions alone. That's even in the three years of each presidential election cycle in which there is no actual convention, and on top of the $32,400 per year individuals can already give each party. 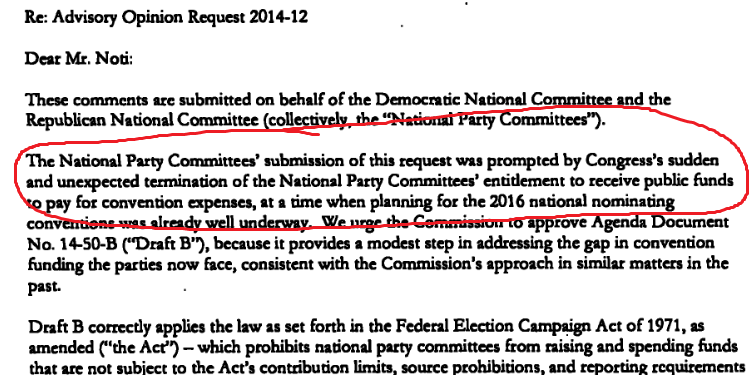 In a letter to the commissioners Wednesday, the parties blamed "Congress's sudden and unexpected termination of the National Party Committees' entitlement to receive public funds to pay for convention expenses, at a time when planning for the national nominating conventions was well underway." That "sudden and unexpected termination" came in the form of the Gabriella Miller Kids First Research Act, which was passed with bipartisan support and signed by President Obama this spring. It ended public financing for the conventions and promised to shift the money saved — $18 million for each convention in 2012 – for children's cancer research. Advocates of campaign finance limits opposed the change. Public Citizen noted that Congress so far has failed to actually provide any new cancer research funding. "Today, the commission is being asked by the same parties to create another loophole in federal election law," the group wrote in a Tuesday letter. The commission has been blocked from acting in recent years because of a three-three split between the three Democratic and three Republicans members. It approved the change today on a 4-2 vote when Democratic vice-chairwoman Ann Ravel voted with the three Republicans.